When you can tomatoes or make tomato sauce you blanch the whole tomatoes in boiling water for a few minutes, and then plunge them into cold water and slip the skins. It’s an easy job and there is a certain pleasure in slipping off the skins and plopping the ripe, red tomatoes into a stock pot to cook down. I use them for sauce, or place them directly into wide mouth jars to pressure can for winter meals. While you could feed the skins to the chickens, why not try something different. 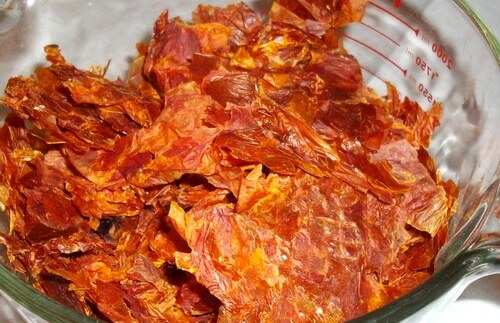 You can dry the skins for winter and make tomato powder. 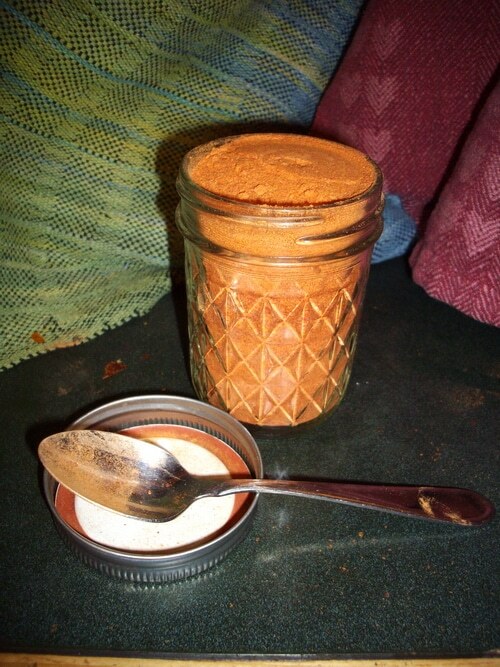 Tomato powder is a versatile condiment. It can be used to thicken soup or sauces. It can be added to pasta to make the noodles pink and give them some extra flavour. It can be added to watery tomato sauce to thicken it up. It can even be used as a base for homemade ketchup. Think of it as dried tomato paste — just add water. The skins from 50 pounds of tomatoes will give you about one cup of dried and ground tomato powder. Not bad for some thing that most folks just toss to the chickens or put in the compost. While that doesn’t seem like a huge amount, you don’t use much to get a richer, thicker marinara sauce. 1. Make sure the skins are free of mould, dirt, or blemishes before you blanch the tomatoes. 2. Cut off any mould or blemishes before blanching. 3. Blanch your tomatoes until the skins slip, about 2 minutes. 4. Remove the tomatoes from the simmering pot and plunge into cold water. 5. When tomatoes are cool enough to handle, use your fingers to slip the skins and use the tomatoes in your intended canning project while reserving the skins for this recipe. 6. Once your canning is done, gather all the wasted skins and layer in a thin layer on your dehydrator trays. Dry overnight or until very brittle and crisp. No moisture should be noticeable in the skins when they are dry. Since this will only use a few trays in your dehydrator use the extra space to dry some of the romas for “sundried tomatoes” or add some Fall fruit to fill the dehydrator. 7. 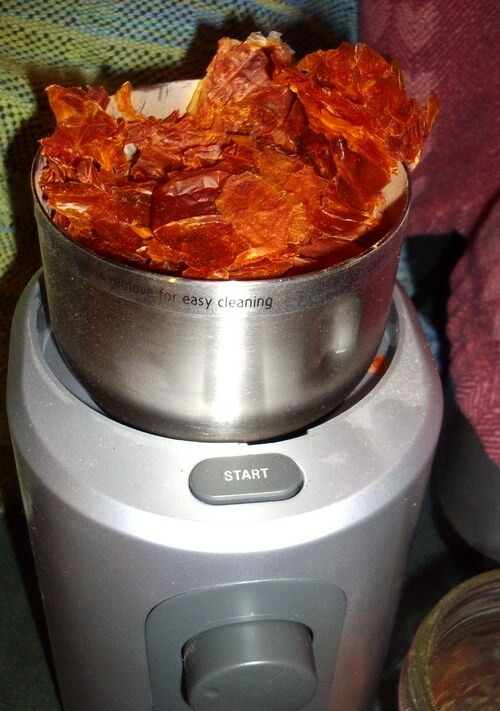 Once the tomato skins are thoroughly dry, remove the skins from the dehydrator and process into powder using an electric spice grinder, coffee grinder, or food processor. My yield was 1 cup of tomato powder per 50lbs of roma tomatoes, plus, of course, the 24 quarts of roma tomatoes that I pressure canned. Use powdered tomatoes in egg dishes, in pizza dough, noodles or tortillas. Add it to soup or stocks for colour and intense tomato flavour. Sprinkle it on scrambled eggs or mix with a few drops of water for tomato paste substitute. 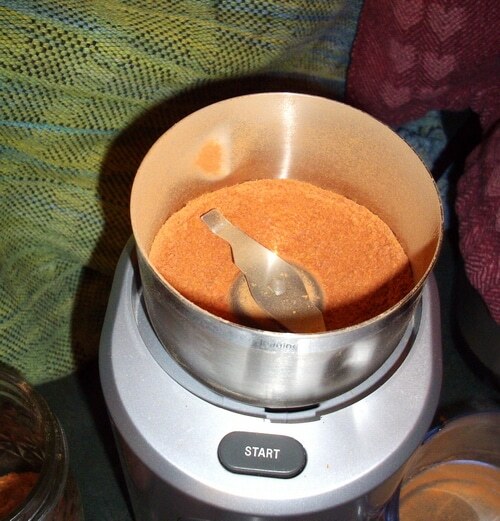 I used a Delfino Intelligent Coffee Grinder originally to make this tomato powder. However, I don’t recommend them for grinding herbs and spices. The engine is not made for the constant use needed to grind down even a small quantity of herbs or spices. I originally liked it because the stainless steel basket is removeable and easy to clean. But the engine is finicky and burns out with very little use. Then the appliance must be trashed because there is no reset button. It is a poorly engineered design. I’ve burned out two of them. One of them stopped working after only a month of light use. Instead use your food processor or the food mill attachment to your Kitchen Aid Stick Blender. I hope you find this tutorial helpful and you’ll be inspired to find another use for those tomato skins besides composting them. 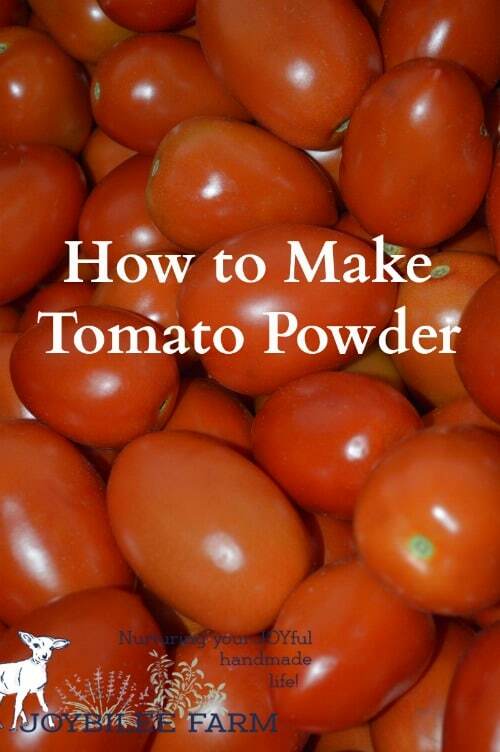 What do you use powdered tomatoes for? I put tomato powder on my salad. Brings it to a whole other level. Wow! Tnks for this great idea. This will reduce wastage of tomatoes. I noticed that tomato powder become clumpsy when kept for a very long time. How do we avoid that please. Thanks. I love this. I already do it and use it to thicken my tomato sauce if I don’t get it reduced enough – oops, am I supposed to admit that:) I also add it to soups and stews to add extra flavor. I use tomato powder in soups and stews but I also have a jar of tomato powder that I mixed with other dried vegetables to add flavor and some extra vitamins to casseroles and dishes that need a little boost ! Love using tomato powder !!! I don’t own a dehydrator, can I dry the skins in the oven on it’s lowest setting? Yes you can. If you have a convection oven, it’s better because it has better airflow. If you have a conventional oven, you’ll want to have the temp around 120 F and you can get that by bringing it up to it’s lowest temp then turn it off and just keep the oven light on. When the temp drops remove the tray and bring the temp up to its lowest again. Turn it off. put the tray back and leave the bulb on. Thank You for sharing. I have looked at tomato powder on different sites and it is expensive! I was stumped on how to dry tomato’s cuz they are so fleshy/juicy. It just never dawned on me to use only the skins, but it makes total sense—now! I appreciate your common sense! How long does the dried tomato powder last? Once its dried it should last a year or two — like dried tomatoes.